I've been shopping at Aldi again, picking up some great deals on spring produce and making them into an amazing four course dinner for you. 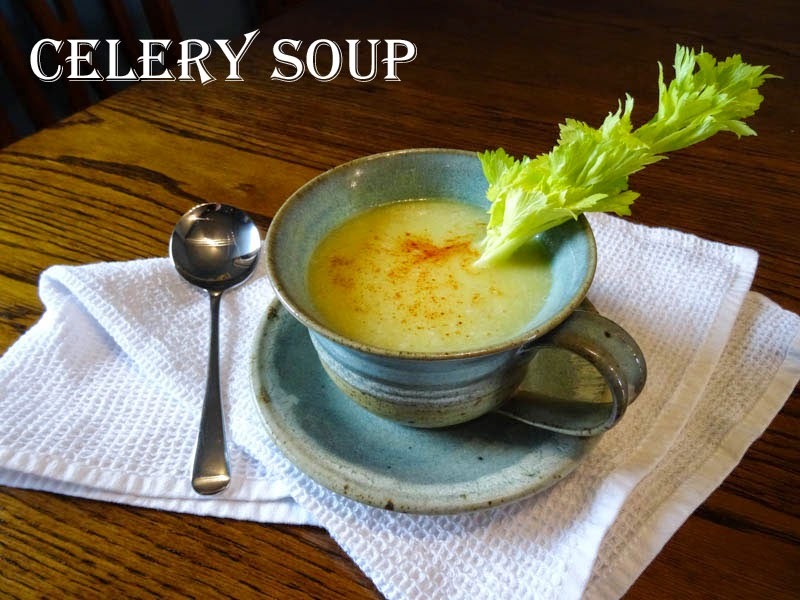 Let's start with some delicious Celery Soup, I found this lovely recipe for dairy-free Cream of Celery Soup on Pinterest, it comes from the very talented Erren's Kitchen and uses potato as a thickener. 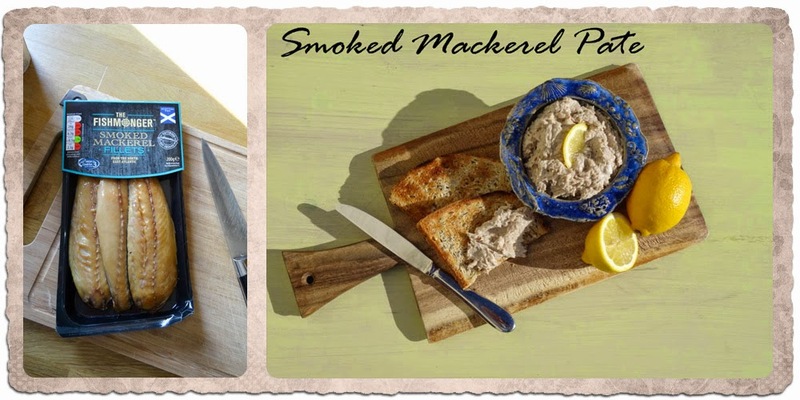 A very simple four ingredient Smoked Mackerel Pate is whizzed up quickly in the food processor and is very moreish. I've served it with large slices of toast but it would be ideal on cocktail oatcakes or thin slices of french bread at a more refined dinner party. 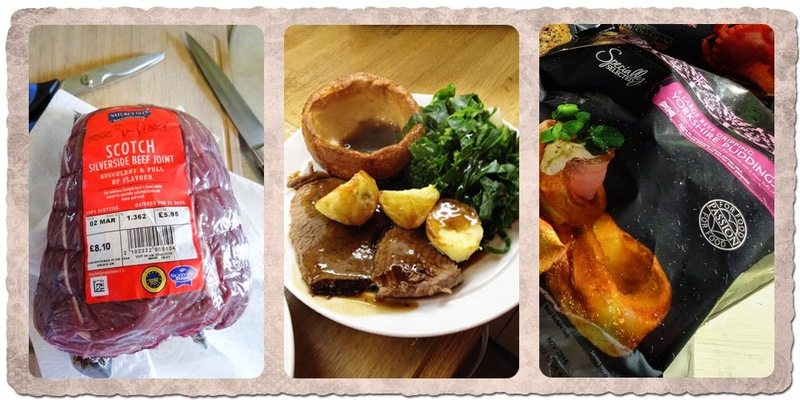 Pot Roasted Scotch Beef with Roast Potatoes, Yorkshire puddings and Spring Greens. The beef was cooked in the Slow Cooker doused with a bottle of dark beer and enough stock to cover three-quarters of the meat, then cooked on low for 8-10 hours. Once cooked, I reduced the cooking liquor by half , by boiling it on the stove to make an intense and delicious gravy. 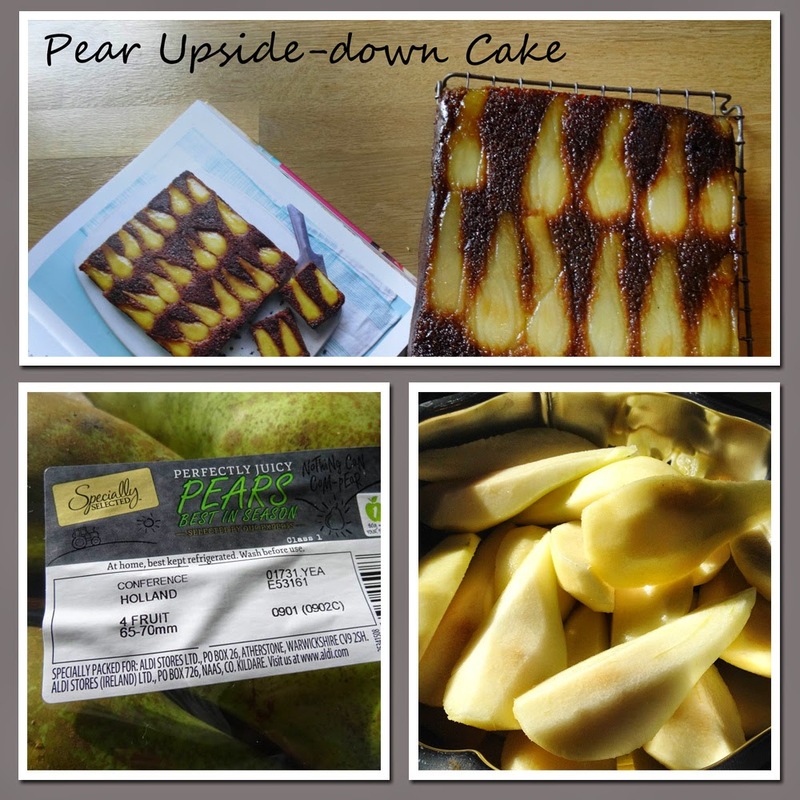 Okay, so pears are hardly 'spring' produce but I couldn't resist these pears, they looked so good and when I peeled and quartered them to make the Pear Upside Down Cake, they were indeed perfect and perfectly ripe. I'll be posting the recipe for the cake very soon, it comes from the latest book Hummingbird Bakery - Life is Sweet which I'll also be reviewing. Many thanks to Aldi for providing me with vouchers to purchase the ingredients for these recipes. I was not paid and all opinions are my own. I haven't had celery soup in years and now I'm really keen to have a bowlful again - I remember liking it, but I'd just forgotten about it. And the pear upside down cake looks fab. Whenever I get a chance to stock up on celery I love to make celery soup! I am alone in my love of cooked celery here in this house. I cannot even get away with disguising celery soup with stilton and white port.... Now I want some celery soup. This looks absolutely delicious. Sounds like a great four course meal, especially that pear cake. That pear cake looks wonderful Janice! I don't use Aldi very often, purely because Lidl is closer and pretty good too. Hee hee, look out for it on the blog soon Charlene. I'd forgotten about it too Choclette. It was really good. I love celery, have you every grown it Heidi? I did once a long time ago, it wasn't to difficult to grow. oh shame Anita-Clare, I'm lucky that we all like celery. Thanks Caroline, more on the pear cake coming soon. That cake looks delicious! There's an Aldi opposite my daughter's dance class, so I often nip in for some fruit & veg while she's dancing - they have a fabulous selection.